Many people think of their old and outdated stairs as a sore spot in their home that although they would like to change, is just too expensive or difficult to renovate. Usually this isn’t the case and in fact there are some very simple things that can be done to help refresh your old stair and banister without replacing the entire system. For example replacement stair treads can take the place of old worn out carpet at a reasonable cost and requiring only basic woodworking skills. 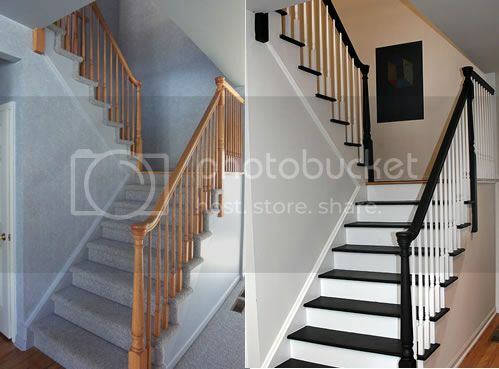 When working with wood stairs keep this in mind, whether you are replacing carpet between two enclosing walls or want to remove your existing balustrade then reinstall atop a new set of beautiful hardwood steps, the process is often so easy that even an inexperienced do-it-yourselfer can handle the job with a few tools (most of which are available for rent at the big construction Box Stores) and some patience. The difference between dingy carpeted steps and solid hardwood stair steps is amazing and often will overcome the necessity of replacing the handrail, balusters and newel posts in a system. These stair treads are available in virtually any dimensions and are available at WoodStairs.com precut to your exact specifications and unfinished or prestained, so that installation is simply a matter of putting them in place, using construction adhesive and finish screws to secure them down. So, if you are considering remodeling your staircase, you owe it to yourself to at least look at the possibility of replacing damaged stair treads or carpet or just adding stair treads to your system. It makes a world of difference that will add to the strength, durability and value of your stairs. This last point is especially important if you are planning to sell your home. The addition of wood stair steps may make just the difference that will distinguish your home from one down the street, helping to sell faster or for more money. You can see the difference replacement stair treads and a little paint can make from the picture above. Using all of the original components this customer added the solid hardwood treads then just repainted the remaining stair parts. If you have any questions regarding your stair or banister, our Stair Specialists are here to help from design through completion. Just give us a call at 888-390-7245 or email us at CustomersFirst@WoodStairs.com.